We are leading trader of Power Meter. 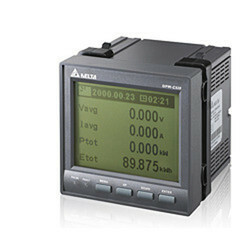 Our competency lies in offering our clients an excellent quality range of Power Meter. Our offered meter is used to monitor current, voltage, power range and four-quadrant metering in an electrical installation. Obtained from certified vendors, this meter is perfectly designed with the use of impeccable class components and latest technology under the stern supervision of deft technocrats who hold vast experience in the domain. This meter is highly appreciated in the market for its easy operation.